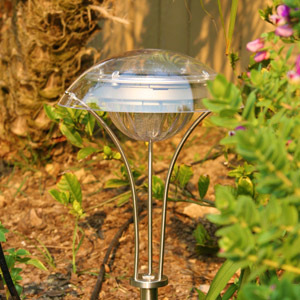 Our stainless steel solar lights are available in ground-stake and hanging models. You can mix and match these lights together to add an elegant, classical look to your garden, or other landscape features. All of these lights are efficient, economical, and environmentally friendly, while still looking great! Since Solar Energy is free to use. This means that solar energy products, like our great line of stainless steel solar lights, have zero operating costs. stainless steel Solar Powered Lights are also environmentally friendly. Solar energy is completely clean and renewable, which means that all solar energy products are a great, renewable energy option. Stainless Steel is a modern look that is here to stay. Stainless steel solar lighting options are available in hanging solar lights, ground stake solar lights, post top solar lights, solar lanterns and even solar birdfeeders. Interested in learning more? Check out our Stainless Steel Solar Lights here.